For the “Lunch and Learn around Neo4j” with Andreas Kollegger at NOSQL NOW, we wanted to use a dataset that was easy to understand and interesting enough for attendees of the conference. This is why we chose to use only the NOSQL NOW conference program from that day as the dataset. Conference data is usually well connected and has the opportunity for challenging data model discussions and insightful queries. So we set up a Heroku instance, which is connected to a provisioned Neo4j database hosting an informational website. It explains Neo4j, the local installation, the Heroku add-on and also lists available drivers for the different languages. We then used a small ruby script with the neography gem by our Neo4j community rock star Max De Marzi to populate the database. 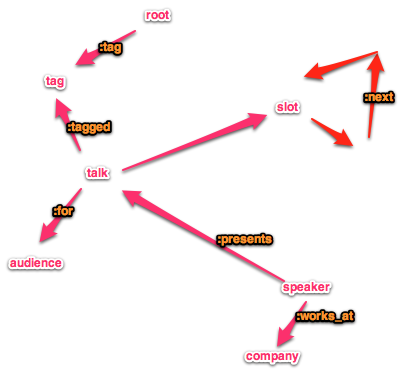 From our example-data site, you can download the graph.db directory for your local Neo4j server. NoSQL has started to gain a lot of popularity lately. Even if many of us modify it as we want. Maybe this is why we love it, right?